There is something magical about a first memory. Think about it: there is a whole period of your early life when you’re so absorbed in each little thing life puts in your line of sight that singling out specific images to hold in your memory is almost too much. Everything is new to a small child, and this explains the oft-mentioned inclination of babies to love the boxes their birthday gifts come in more than the toys themselves. They don’t know any better, and really, who’s to say that the box isn’t better? When I was a toddler, my parents took me to Disneyworld, but I can’t remember it any more than I remember going to the fabric store ten minutes from our house with my mom. What I do remember is having a happy childhood full of love and security, and those recollections would exist even without Mickey Mouse. Research shows that children under the age of two lack the ability to store memories, and what episodic memories they do manage to retain from the age of two to four start to fade by the time they’re seven. It’s called childhood amnesia, and I’d conjecture that it’s one of the reasons why parents frantically record each precious step their children take. They need some memento from those priceless early years, and their own brains certainly aren’t going to provide it. I often find myself looking at C through the viewfinder of my camera because I want to remember for her. I want to hoard her every move so that someday she can look back on the scraps I pulled together and have a more complete history of her life. She *loves* this one park and we go just about every week, but she likely won’t remember it when she’s older. Eventually, though, children’s brains develop and they form memories outside of the ones that are plastered in their baby books (or blogs). As they begin to develop self-awareness, they also become aware of the events and images that shape their lives. And that’s why I think first memories are kind of magical. They are relics from our earliest personal histories. They are cave paintings and the development of our native tongue. For this month’s Remember the Time theme, write about your earliest memory. Grab the badge and stick it at the bottom of your post. Next, add your link below in the blue Inlinkz box, and come back to see all the other great posts your blogging pals have written! 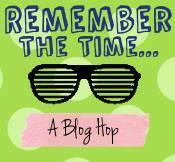 Comment on them and tweet and share your favorites using the hashtag #RTTbloghop. The linkup will continue until March 20th at 11:55 PM EST, so get your link in before then. I sometimes regret that I don’t have more footage of my kids, but I decided that I was looking at them through a lens and not getting the whole picture, so to speak. Being in the moment has both it’s advantages and disadvantages. I’ve been vigilant about trying to remember their adorableness and have many photographs, but their tiny voices are not recorded. My own first memory is of my father giving me a doll almost as big as I was. I turned it into a short story. Can I read that story? I’d really love to! I’ll have to check the hard drive to see where I stashed it and I’ll send it to your email. it’s an excellent question, and I envy my daughter who gets to do all sorts of things for the first time. I really am jealous of my daughter too sometimes, but then I remember that she gets scared of garbage trucks because she thinks they’re monsters. I would argue that it’s possible to log a memory before age of two if it registers in the brain as ‘traumatic’. I have two of those – one is of a bunch of birds flying around me while I was in the stroller….and Hitchcock’s Birds hadn’t even yet been filmed! Though, now as I think anout it, I was in CA at the time and his film was shot there too so perhaps he witnessed my 18 month terror and decided to expand upon it? We have a friend in our close social circle who claims he remembers being born. We just look at each other at that remark – it’s not a discussion or even a memory I want to explore or engage in. Your head is squeezed, you can’t breathe, someone holds you captive, upside down, whacks you on the rear, it stings like crazy so you wail out in terror and then you’re rewarded with warm milk. Yeah, I don’t think I’d want to remember that either. The only person who enjoys the situation during a birth is the mom, who doesn’t have to push anymore. Recently I was out on a walk with one of my mom friends, and this, ahem, eccentric man who was also at the park saw our kids in their stroller and mentioned that he had memories of being a newborn and being pushed around in a baby buggy. So weird. Okay, this one I absolutely must must must join in on. Seriously. I got. . . Well, anyway. So yeah. I’m glad you did this. Extremely. Yaya! I am so excited that you want to join in! Definitely memories started to stick in my head by age three, Emily. That was when I was deemed old enough to go to the movies – a rite of passage that thrilled me into suffering a neck spasm. I’ll never forget that, too. I remember the wonder and amazement at age 3 when I turned over a piece of paper I was drawing on and realized there was another side. It was so amazing I still have a glimmer of it when I think of it today. I find it fascinating how easily memories can be manipulated, also. I have “memories” of the home I lived in up until age 3, but honestly, I bet that they are composites of pictures from my baby book and from stories told to me by my parents. The first memory I know for sure is mine is from the first day of kindergarten – I didn’t want to go, so I got all dressed and ready and then hid behind a door. Oh, absolutely. I think I wrote something awhile back about how all the videos my parents made of my brother and me make me wonder what I authentically remember from my childhood and what I only remember because it was on tape. Such a modern problem. All I remember from my first day of kindergarten was that I wore Punky Brewster underwear. 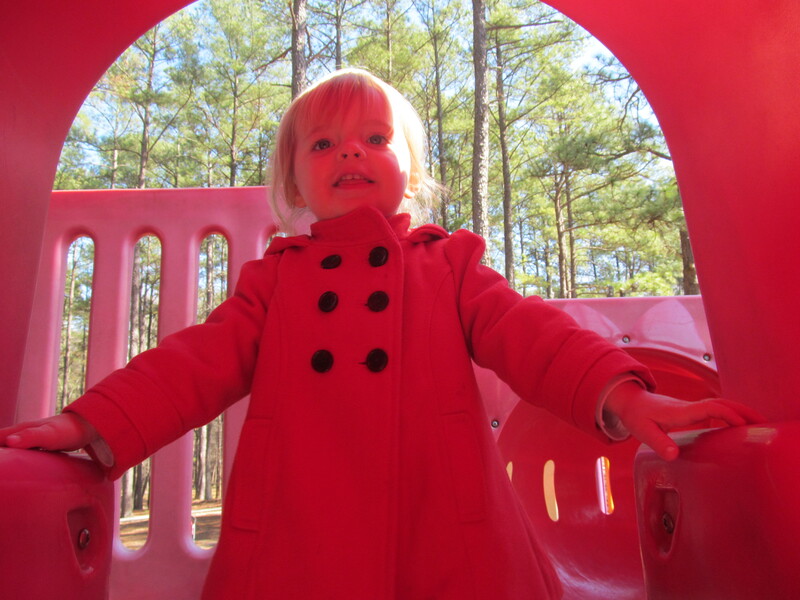 I love her little red coat! I’m so glad I have all the video of my first kid. The second? We were not quite as rowdy with him – so he’ll only get partial memories. I never thought of the connection between knowing the memories will fade and trying to capture them. Interesting, and I’ll bet you’re right. Sometimes just to prove it, because they do some pretty unbelievable things! I just sent myself an email with the link to this post. In the subject I wrote “Do this!” A great jumping off point for some creative (and cathartic?) writing. I also agree with the commenter who mentioned that T-shirt. I don’t know when I last did something for the first time. For a while I was trying to do something similar – “Do one thing a day that scares you.” I found that to be a really good policy too. Guess I will have to reboot it. I really hope you link up with us! The link up says the link has been closed. I posted so I’d like to link if I can get in there. Hey Kelly! Sorry about that! I fixed it and you can add your link now. Looking forward to reading it. Thanks. Glad there was an actual issue not just me being thick-headed or the visit to the mechanic where the stupid vehicle will not make the noise it’s been making non-stop for two weeks. You will notice I might be slightly technically challenged since I didn’t quite post it right. Sigh. But it’s there now. Nope! It was my fault, not yours. I always mess up when I’m scheduling these things.